The Daily Mail Circuit of Britain air race was a British cross-country air race which took place from 1911 until 1914, with prizes donated by the Daily Mail newspaper on the initiative of its proprietor, Lord Northcliffe. It was one of several races and awards offered by the paper between 1906 and 1925. The 1911 race took place on 22 July and was a 1,010 miles (1,630 km) event with 11 compulsory stops and a circular route starting and finishing at Brooklands in Surrey. The winner was Jean Conneau in a Blériot XI who took 22 hours, 28 minutes to complete the course, an average speed of 45 mph (72 km/h) and received the first prize of £10,000. The runner up was Jules Védrines in a Morane-Borel monoplane with James Valentine, in a Deperdussin, third. The 1913 race was for British seaplanes and had a first prize of £5,000. Only one aircraft started the course; it was damaged when landing near Dublin, and did not complete the course. The 1914 race, also offering a prize of £5,000, was to have been held between 1 and 15 August. It was cancelled due to the outbreak of the First World War. The 1911 Daily Mail Circuit of Britain was a contest for the fastest completion of a course around Great Britain. The proprietors of the Daily Mail offered a £10,000 prize to any aviator to complete an approximately 1,000 miles circuit of Britain in the shortest time. 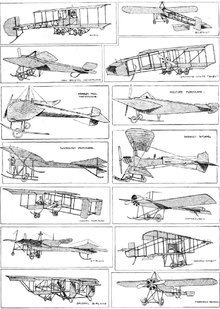 The contest was run by the Royal Aero Club and was held between 22 July 1911 and 5 August 1911. Following the success of the £10,000 competition for the 1910 London to Manchester air race, the editor announced that a further £10,000 prize would be awarded, it would either be between London and Edinburgh and return or London and Paris and return. It was decided that the competition would be a tour round Great Britain and a committee of the Royal Aero Club was formed to set the rules and organize the competition on behalf of the Daily Mail. For an entrance fee of £100 the event was open to all licensed aviators, and as well as the Daily Mail prize a number of smaller prizes were also offered. The circuit was to start and finish at Brooklands, and the competitors had to land at Hendon, Harrogate, Newcastle, Edinburgh, Stirling, Glasgow, Carlisle, Manchester, Bristol, Exeter, Salisbury and Brighton. Four competitors completed the course, the first and winner of the prize was the Frenchman Lieut Jean Louis Conneau, flying under the name of André Beaumont. 1 André Beaumont Blériot XI Completed course - First to return to Brooklands and winner of the £10,000 prize. Although flying as "André Beaumont" he was a Lieutenant Jean Louis Conneau of the French Navy. 2 H.J.D. Astley Universal Aviation Company Birdling monoplane Landed at Irthlingborough due to sickness. 9 Jules Védrines Morane-Borel monoplane Completed course, first to Hendon and was the second to arrive back at Brooklands. 11 G. Blanchet Breguet Type III First stage only completed, damaged aircraft in a forced landing at Streatley. It was repaired but he hit a tree after take off and wrecked the aircraft. 12 Lt. R.A. Cammell, RE Blériot XI First stage only completed, retired after a forced landing east of Wakefield. 13 E. Audemars Blériot XI First stage only completed, retired after two attempts to travel north from Hendon were stopped by fog. 14 James Valentine Deperdussin monoplane Completed course, third to arrive back at Brooklands. 23 Olivier de Montalent Breguet Type III Retired following a forced landing near Wetherby where he broke his propeller. 24 Gustav Hamel Blériot XI Reached Thornhill, north of Dumfries, before he retired. 25 Lt. H.R.P. Reynolds, RE Howard Wright 1910 Biplane Retired after aircraft was damaged at Harrogate. 27 Bentfield Hucks Blackburn Mercury Landed at Barton near Luton with engine problems. 30 Lt. H. Bier Etrich Taube Aircraft damaged in a landing at Codicote near Hatfield after radiator problems. Only aircraft with a passenger Lt. C. Banfield. The race began at Brooklands on 22 July 1911 with a short 20 mile section to Hendon Aerodrome, only 21 of the 30 competitors started and 19 headed for Hendon of which 17 arrived. Newcastle to Edinburgh 92 miles, the same five later reached Edinburgh. Total distance 383 miles with stops at Stirling, Glasgow, Carlisle, and Manchester. Five started from Edinburgh but only four made it to Bristol, they were all to complete the contest. Total distance 224 miles with stops at Exeter, Salisbury Plain. All competitors had to complete the last 40 miles to Brooklands before 19:30 on 5 August 1911. Beaumont was the first to arrive back on 26 July 1911 - 1 hour 10 minutes before his fellow Frenchman Jules Vedrines - he had travelled 1,010 miles in 22 hours 28 min 18 sec. Valentine, arrived back on 4 August 1911 followed the next day by Cody who was the fourth and the last to arrive at Brooklands on 5 August 1911. Conneau won the £10,000 prize for the first to complete the circuit. He also won the Entente Cordiale prize of 50 guineas (£52.50) from the proprietors of Perrier table water for the first Frenchman to complete the course. Vedrine, Valentine and Cody all equal shares of prizes from Sir George White, the chairman of the British and Colonial Aeroplane Company (£250 total) and the British Petroleum Company Limited (125 guineas total or £43.75 each) for finishing the course. Cody won a £50 prize from the Northumberland and Durham Aero Club for the first British machine to arrive in Newcastle. Valentine received a £50 tea service from the Harrogate Chamber of Trade for the first British aviator to reach Harrogate and a 100 guinea gold cup from the Brighton Hotels Association for the first British aviator to reach Brighton. He also won the Entente Cordiale prize of 50 guineas (£52.50) from the proprietors of Perrier table water for the first Englishman to complete the course. The 1913 race, offering prize of £5,000, was for floatplanes, which had to be of all-British construction. The course, totalling 1,540 mi (2,480 km) had to be completed within 72 hours, although since no flying was allowed on Sundays this period was in practice a day longer. Entrants included the Cody Waterplane, the Radley-England Waterplane and the Sopwith Circuit of Britain floatplane. Cody was killed during a test flight of his design on 7 August when his aircraft broke up in flight, and the Sopwith, flown by Harry Hawker with Harry Kauper as passenger, was the only aircraft to start; it retired after being damaged in an emergency landing near Dublin having completed about two-thirds of the course. Hawker was given a prize of £1,000 for his effort. ^ a b c d e ""The "Daily Mail" £10,000 Air Race, Order of Starting". News. The Times (39637). London. 14 July 1911. col F, p. 8. ^ a b c d e f g h i "The Daily Mail Circuit of Great Britain". Flight. 22 July 1911. pp. 626–636. ^ a b c d e "The Daily Mail Circuit of Great Britain". Flight. 29 July 1911. pp. 652–661. ^ a b c d "The "Daily Mail" Air Race Official List Of The Awards". Official Appointments and Notices. The Times (39668). London. 19 August 1911. col G, p. 3. "A Concise History of Air Racing". Society of Air Racing Historians. Retrieved 30 August 2008. "The new Daily Mail prizes". Flight. Flight Global. 5 April 1913. Retrieved 30 August 2008. This page was last edited on 31 December 2018, at 17:01 (UTC).